Rangelands in the western United States provide essential grazingland for hundreds of thousands of cattle and other livestock as well as a home for a vast array of native plants and animals. And since these rangelands make up a large part of the U.S. public land system, taxpayers often foot the bill for upkeep of the hardscrabble holdings. So Agricultural Research Service scientists across the West are collaborating to make sure the money used to sustain and repair these arid ecosystems is spent on programs that work. For millennia, periodic wildfires have been an integral part of the rangeland equilibrium among plants, animals, terrain, and climate in the western United States. But changing climatic patterns and invasive plants like cheatgrass now fuel fires that are more frequent—and more fierce—and the previous balance of fire, flora, and fauna has been lost. So after fires, public land managers often quickly reseed burned areas to provide watershed protection and control soil erosion. “Right now restoration plans must be submitted 3 weeks after a fire has occurred, before plants have had time to recover on their own. We need to figure out how to evaluate the extent of postfire mortality for plants and decide whether or not it’s always necessary to reseed after fires,” says rangeland scientist Tony Svejcar. He’s the research leader at the ARS Range and Meadow Forage Management Research Unit at the Eastern Oregon Agricultural Research Center (EOARC) in Burns, Oregon—right in the heart of high sagebrush country, where the lab equipment includes a working fire truck. 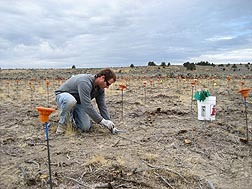 In fall 2010, at ARS’s Northern Great Basin Experimental Range near Burns, Oregon, plant physiologist Jeremy James sets up 1-square-meter plots for planting to determine seedling establishment. Although seeds planted in the fall on postfire rangelands usually germinate over winter and spring, their low establishment rates are often attributed to insufficient precipitation or competition from invasive grasses. So James and Svejcar compared the success of postfire reseeding management on four sites in Oregon where wildfires in 2007 had burned a total of 300,000 acres. The scientists obtained seeds for an assortment of rangeland species, including desert wheatgrass, western wheatgrass, basin wildrye, Snake River wheatgrass, Sandberg bluegrass, Siberian wheatgrass, yarrow, and blue flax. Then they seeded study plots either with a rangeland drill—the most commonly used method to reseed postfire sites—or by hand, so that burial depth could be tightly controlled. In addition, some plots received irrigation and weeding so that the relative importance of seed placement, annual precipitation, and competition from weeds could be assessed. At ARS’s Northern Great Basin Experimental Range near Burns, Oregon, technician Lacy Carpenter evaluates seedling productivity by counting seedlings in the establishment plot. Before the study started, James thought the most pampered plots—those where seeds were buried by hand at appropriate depths, watered, and weeded—would have the highest rates of establishment. But he was only partially right. “We had the best seed establishment in hand-seeded plots—around 14 plants per square meter, compared to only around 4 plants per square meter in the drilled plots,” James says. “But weeding or watering didn’t affect the outcome at all.” This indicates that soil water availability in spring was sufficient to support seedling growth and that weed abundance was not high enough to interfere with growth, he says. James and Svejcar also note that although the wildfires at the four study sites burned away all the sagebrush, other quick-growing native perennial herbs soon recovered, which suggests that some postfire landscapes might not need reseeding at all. In their study, invasive cheatgrass didn’t pose a challenge to the reestablishment of native perennials because it didn’t come back in high densities after the fires.The scientists published their results in 2010 in Rangeland Ecology & Management. At a remote site in the northern Chihuahuan Desert, ARS molecular biologist Mary Lucero (left) and New Mexico State University graduate student Lori Kae Schwab evaluate establishment and reproductive success of black grama grass, Bouteloua eriopoda, transplants. The PVC tubes embedded in the ground contain a hydrogel, which irrigates the transplants. Taken together, these findings suggest that it could be time to revamp traditional approaches to postfire rangeland restoration, starting with assessments of whether reseeding is even necessary. If it is, this research suggests that major improvements to restoration success will be linked to advances in seeding technology and improving seed-soil contact. It appears that traditional assumptions about limitations to rangeland restoration—drought and weeds—don’t limit successful seed establishment nearly as much as the seeding practices currently used by land managers, at least under the conditions studied by James and Svejcar. “As a result of this research, we now have a fairly clear indication of the importance seeding technology has in restoration success relative to drought and competition from weeds. It appears that small improvements in seeding technology could yield large increases in rangeland restoration success,” says James. Meanwhile, many rangelands in the southwestern United States have been stripped of vegetation by residential development, mining operations, recreational activities, and other changes to the landscape. That reduces habitat for wildlife and forage for grazing, makes the soil susceptible to erosion, reduces water infiltration, and even creates more dust along highways, reducing visibility for drivers. Conditions in the arid region make restoring degraded vegetation extremely difficult. Summer temperatures can exceed 100°F for days at a time, and rainfall is scarce and highly variable. The monsoon season in late summer and early fall is the preferred time for planting, but rainfall patterns are unpredictable and the monsoons can arrive anytime between July and September. The cost of irrigating remote, undeveloped range sites is often prohibitive. The number of daughter plants associated with each transplant is an important measure of the transplant’s reproductive success. 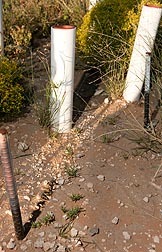 Here, linear stolons emerging from the transplants at the base of each PVC tube produce chains of daughter plants that appear as islands of grass surrounded by bare soil. 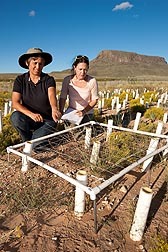 Mary Lucero, a molecular biologist at ARS’s Jornada Experimental Range in Las Cruces, New Mexico, is looking for ways to fortify native grasses so that they will be better equipped to restore degraded rangeland habitats. In long-term studies, she is exploring whether microbes associated with hardy woody shrubs can be transferred into native grasses so they can be used as rangeland restoration tools. As part of that effort, she is evaluating the competitive abilities of grasses that have been treated with various microbes and transplanted into the remote desert habitat. In a related experiment, Lucero and her colleagues filled tubes fashioned out of PVC pipes with hydrated gels, buried them alongside the roots of a native bunchgrass, and positioned the pipes so that moisture would be available to the grass roots. Lucero designed the experiment to determine whether the hydrogel-filled tubes could provide enough moisture in the dry, remote region to ensure the survival of the native grasses that she is studying. Hydrogels are already used in some commercial products for jump-starting grass seedlings and for cutting back on how often a gardener has to water a garden. Lucero initially tested both an acrylic crystal gel marketed as “Soil Moist” and a starch-based gel known as “Soil Moist Natural.” But she chose to work exclusively with the acrylic gel because it is easier to manage and less likely to allow moisture to seep too deeply into the soil for the shallow grass roots to reach. In results published in the Journal of Arid Environments, Lucero and her colleagues found that 1 liter of hydrogel-bound water was sufficient to support black grama grass (Bouteloua eriopoda) transplants through reproductive maturity. More recently, nearly 700 greenhouse-propagated native plants hydrated with the gels have survived transplanting and become established in field plots in the Chihuahuan Desert environment—and have produced offspring. Lucero’s results show that hydrogels can be used to irrigate native grasses transplanted into harsh, dry environments and that they may be useful tools for studying restoration of rangeland habitats. Back in Burns, Svejcar reflects on the dynamics driving the need for rangeland studies. “Lots of rangeland is still in good shape because a lot of people have put a lot of effort into effective rangeland management,” he says. “Now we need to keep up successful management of the intact rangeland and also focus on restoring the damaged rangelands. And we need to deliver products that help land managers achieve both goals.”—By Dennis O'Brien and Ann Perry, Agricultural Research Service Information Staff. 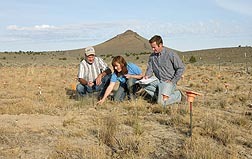 This research is part of Pasture, Forage, and Rangeland Systems (#215), an ARS national program described at www.nps.ars.usda.gov. Tony Svejcar and Jeremy James are in the USDA-ARS Range and Meadow Forage Management Research Unit, 67826-A, Hwy. 205, Burns, OR 97720-9399; (541) 573-8901 [Svejcar], (541) 573-8911 [James]. Mary Lucero is at the USDA-ARS Jornada Experimental Range, 2995 Knox St., Las Cruces, NM 88003; (575) 646-4842. "ARS Scientists Rally ’Round the Range" was published in the January 2012 issue of Agricultural Research magazine.